The particularly economical solution for decentralization at power levels up to 3 kW: MOVI‑SWITCH®, the compact and sturdy gearmotor with integrated switching and protection functions and with IP54 degree of protection; also available with IP55, IP65 or IP66 degree of protection. Additional space requirements in the control cabinet? Not with the MOVI‑SWITCH®. 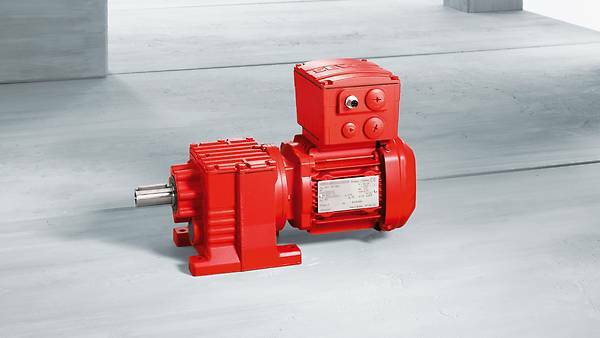 Are you looking for a particularly sturdy and economical gearmotor with integrated switching and protection functions? No problem. The MOVI-SWITCH® gearmotor for decentralization applications up to 3 kW is exactly what you are looking for. The switching and protection functions integrated in the motor terminal box make it possible. You can choose between designs with a contactless star bridge connector or a contact-based switching element. The various designs also offer two different options for the direction of rotation: one direction of rotation, clockwise or counterclockwise depending on the phase sequence, or two directions of rotation, clockwise and counterclockwise independent of the phase sequence. All in one motor. Our 3 MOVI-SWITCH® designs are compact, sturdy and equipped with high-performance features. Thermal motor protection and an optional AS-Interface, all integrated into the motor in a compact fashion. All AC motors and brakemotors in the MOVI-SWITCH® range can be easily combined with suitable gear units from our SEW‑EURODRIVE modular system. MOVI-SWITCH® can be used in a wide range of ambient conditions. It is available with the IP54 degree of protection, or alternatively with the IP55, IP65 or IP66 degrees of protection, and is designed for ambient temperatures from -25 °C to +40 °C (to +60 °C). Our global network ensures we are close wherever and whenever you need us. We have the know-how and tools to provide optimum advice and support. thanks to a solid metal housing for direct installation in the field. via either terminals or a wide selection of plug connectors. Fast, safe installation and easy unit replacement. because the switching and protection functions are completely integrated, which reduces the need for cabling and saves control cabinet space.